8x10 Cleveland Indians photo autographed in thin blue marker by the late, legendary Hall of Fame pitcher Bob Feller, who added HOF 62 and 1936 Chicago (apparently the year and city when and where this photo was taken). With certificate of authenticity from AutographsForSale.com. ONLY ONE AVAILABLE FOR SALE. 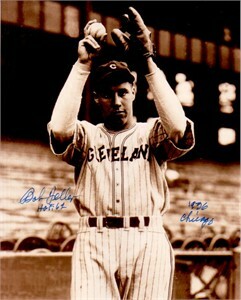 Bob Feller autographed Cleveland Indians baseball inscribed H.O.F.